Farma ceutica REMEDIA S.A. is in top 10 increases in shares, with a percentage of 41%, surpassing the growth percent of OMV Petrom and BT. 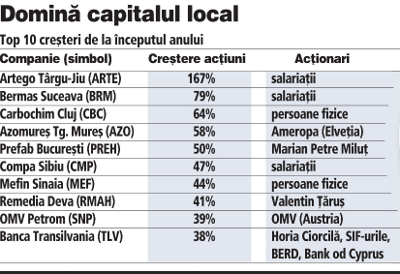 The top was made by Ziarul financiar, in its 21.11.2012 edition. Farmaceutica REMEDIA S.A. is included among the companies that have reported substantial profit growth in nine months .